This phenomenon has vexed various public institutions of higher learning, many of which have faced litigation for inaccessible Web content and technologies. Such claims of discrimination often precipitate into litigation when a public entity relies on a Web-based content management system or a collaboration technology for providing students with course material. A disability rights organization or student then finds it inaccessible and segregating, leading to the filing of a lawsuit. Generally speaking, complainants fall into two categories: those who file administrative complaints with public entities agencies they believe are not doing enough to insure accessibility and those who file actions in U.S. District Court founded in discrimination. Neither action is pleasant for an entity’s HR and legal staff to contend with. According to the University of Washington, “electronic and information technology may be inaccessible to people with disabilities if it provides only one way for users to gain access to or manipulate information. For example, people who are blind cannot read instructions presented only in a visual format; people who are deaf cannot understand content that is presented only aurally; people who are colorblind cannot discriminate between color-coded options; people with specific physical limitations cannot use a software application that requires use of a mouse; people who use wheelchairs cannot operate a fax machine if the controls are positioned too high or too far for them to reach from a seated position.”. Generally speaking, public entities against which claims have been filed generally admit, quite candidly that because of security, identity theft, privacy and other concerns, accessibility often takes the proverbial backseat. With the passage of the Rehabilitation Act of 1973 (with amendments in 1998), Congress prohibited discrimination based on disability in Federal employment and federally funded programs and services, by Federal contractors, and in the availability and use of Federal agencies’ electronic and information technology. Three sections that apply to the accessibility of technology are highlighted below: Section 501, Section 504 and Section 508. Section 501 of the Rehabilitation Act requires Federal agencies to provide reasonable accommodations for their employees with disabilities unless doing so would impose an undue hardship. To be eligible, an employee must be able to perform the essential functions of the job with the accommodations. Reasonable accommodations may include technologies designed to facilitate completion of these essential functions. Section 504 of the Rehabilitation Act states that “no qualified individual with a disability in the United States shall be excluded from, denied the benefits of, or be subjected to discrimination under” any program or activity that either receives Federal financial assistance or is conducted by any executive agency or the United States Postal Service. Each Federal agency has its own set of Section 504 regulations that apply to its own programs and to the entities that receive Federal aid from them. These regulations generally include requirements for reasonable accommodation for employees with disabilities; program accessibility; effective communication with people who have hearing or vision disabilities; and accessible new construction and alterations. Section 508 of the Rehabilitation Act requires that when Federal departments and agencies procure, develop, maintain or use electronic and information technology (EIT), they must ensure that they comply with the accessibility standards developed by the Architectural and Transportation Barriers Compliance Board (Access Board), unless doing so would pose an undue burden on those Federal departments or agencies. The purpose of the law is to ensure that Federal employees and members of the public with disabilities have access to the same information and technologies as employees and members of the public without disabilities. Many states now have enacted legislation that essentially mirrors the federal laws noted above. 1. Testing Web Pages Before Posting. Each agency should evaluate for accessibility all new Web pages before they are posted. Existing Web pages should be tested as they are updated. Testing should be done with text-only browsers and, where possible, with assistive technology such as screen reading software to ensure that the experience of users with disabilities is comparable to that of others. 2. Agency Web Guidelines. Each agency that has developed style guidelines to maintain a consistent “look and feel” of its Web pages should review those guidelines to ensure that they will maximize the accessibility of the agency’s Web pages. 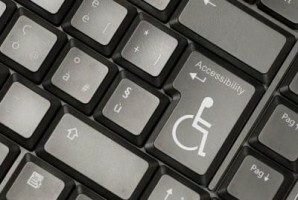 The concept of IT accessibility is not a luxury but a necessity in today’s high-tech world. All citizens and employees should have equal access to the IT service offered by public entities.